Rural properties are attractive to many people. These homes offer sprawling green space away from busy cities. Rural residents enjoy cleaner air and a tight-knit community. Often, these communities offer a slower pace of life that is very peaceful. But because rural homes are not connected to city systems, plumbing systems look different than in houses located within city limits. 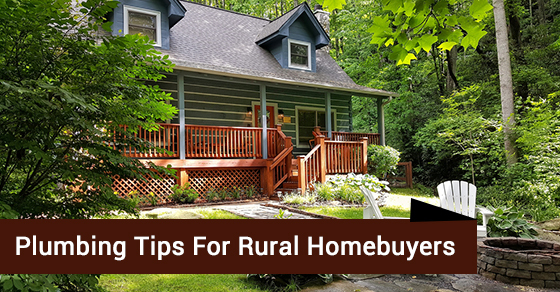 If you are buying a rural home, here are some plumbing tips to keep in mind to ensure that your investment is a solid one. Rural homes are hooked up to septic systems instead of commercial sewer systems like houses in the city. Septic systems take waste from the home and transfer it to a holding tank where it breaks it down. The septic system then transfers any remaining liquid to what is called a “leach field.” The benefit of a septic tank is that it typically result in lower property taxes. However, since it is an expensive system, it is important that you make the sale of your house contingent on a septic pump and inspection. Another key point to consider here is that your septic tank is capable of handling the number of occupants you plan to have in your home. Rural homes tend to rely on well water systems and not municipal water due to the fact that they don’t have the option to connect to public water. A well water system is designed in such a way that it obtains groundwater for water use. As such, it’s always a good idea that you test the water to ensure that it’s free of contaminants and potentially very dangerous chemicals. You might want to also look into some sort of water treatment system for your home. Also keep in mind that while well water systems are mostly free, they do require regular maintenance and tests to ensure that the water is safe to drink given that it is coming from groundwater.